Every car owner knows that each day, wear and tear takes its toll on their vehicles. Most of us have been faced with paying for a major automobile repair such as replacing tires, a transmission or even an entire engine. In order to avoid expensive repairs, here are a few things you should be checking on a regular basis to make sure your car is good to go for the long haul. Typically, air filters are conveniently located right under your hood near or at the top of your engine. Simply take out your air filter and hold it up to a fairly strong light source. If you can see the light coming through the filter, it is usually fine. If you can’t see the light very well even after dusting it off a few times, you probably need a new filter. Filters are very inexpensive to replace, but replacing them often will certainly prolong the life of your vehicle and increase your gas mileage. Your oil should typically be changed every 3,000-5,000 miles. Depending on the age of your vehicle and whether or not it leaks, you should check the oil at least a few times between changes. Your engine may need an extra quart here and there to make sure it is running smoothly. When checking your oil, remove the dipstick once to clean it off. Then, place it back in the engine and remove it again to get the most accurate reading. The oil level at the bottom of the dipstick will show you what your car needs. 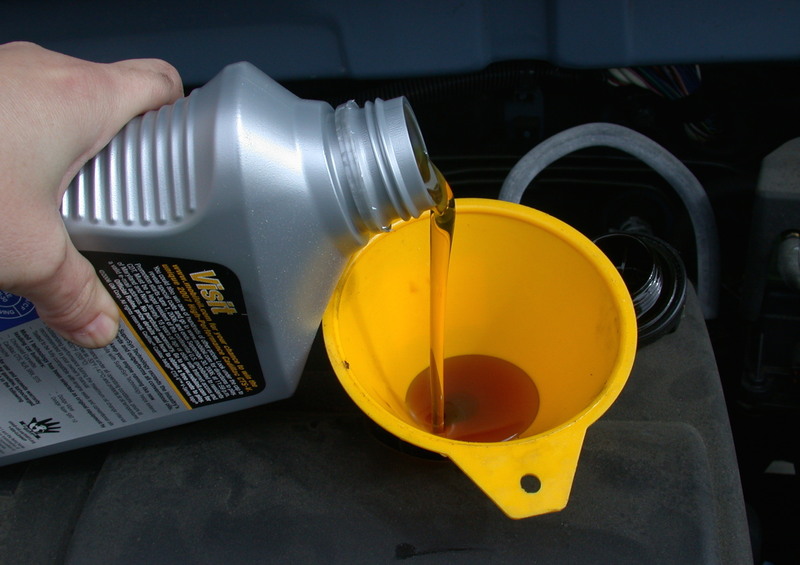 Checking and changing your oil regularly is the most critical component to vehicle maintenance. By not changing it regularly, you will surely find yourself stranded without a working vehicle and facing a complete engine replacement that will cost you thousands of dollars. To check your car’s brake fluid level, locate the reservoir which is usually near the brake booster and master cylinder, again conveniently located near the top of your engine. Unscrew the cap and see if the fluid level is within roughly half an inch or so from the top. Also, make sure to check for discoloration in the fluid, and clean off any dirt or dust surrounding the reservoir to keep everything working at its best. Overly worn or improperly inflated tires are the cause for thousands of accidents every year, so you want to constantly make sure they are in good shape. Simply a change in weather or elevation can have an impact on your vehicle’s tire pressure. A tire gauge from any local auto parts store can tell you the PSI (pounds per square inch) for each tire in just a matter of seconds. Check the tread on each tire to see if the depth is starting to get worn down. It’s also a good idea to have your tires rotated every 7,500-10,000 miles to make sure they wear evenly and don’t need to be replaced as often. A quick inspection of your car’s battery can save it many miles in the long run. Make sure to look for frayed or broken cables attached to the terminals. Tighten down the nut that secures the battery onto the vehicle. Clean off any dirt or collected dust. Most importantly, check both the positive and negative terminals for possible corrosion. A corrosion build-up can weaken the life of your car’s electric power and even cause electrical or computer problems. The easiest way to check coolant levels is to look at the outside of your coolant reservoir and see if it’s up to the “Full” line. If it isn’t, simply add a 50/50 mixture of coolant and water until it is back to the top. Some coolants already come pre-mixed, which makes things a bit easier for you. A good rule of thumb is to never add coolant to a hot engine. Make sure your car has been sitting for a few hours before you add fluid to avoid getting burned and causing more problems to your vehicle. Conducting these small monthly checkups is the best way to keep your car performing at the maximum level possible, and it will help you catch any potential problems in their earliest stages. Simply taking 15 minutes a month and going over these steps will save you plenty of money down the road in vehicle repairs and will cause you to feel a bit safer every time you get behind the wheel.